Our buddy Chuck Carroll of CBS Sports recently spoke with former WWE Superstar AJ Lee to promote her new "Crazy Is My Superpower" book. She discussed equal pay in WWE, her violent childhood, the time she overdosed on painkillers & antidepressants, how she's trying to use that experience to help others battling mental health issues and more. There has been an increased emphasis put on women's wrestling in recent years. It's been called the "women's revolution" with the "Divas" title having been stripped away. Although it officially happened after you left, it seems to me that you were a big part in getting female performers to where they are now. The women are basically on par with the guys now. That makes my heart swell. That's all I ever wanted for the industry while I was there and for all the wonderful women after I was gone. There are a lot of really great girls who are still there that I was really fortunate enough to work with or have their tryout matches. I just want the best for them and I'm so happy that they're getting their time. That's all that we could ever hope or fight for. I'm so proud of them. I hope they're also getting paid as much as the guys since they're seen as just as important. I hope that they're also getting paid because that's half the battle, honestly. Wrestling's old adage: never say never. I'm sure you are asked this all the time so let me be the one millionth and one person to ask you this. 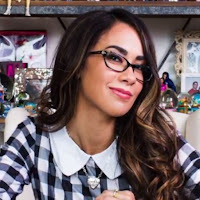 Will we ever see AJ Lee back in a wrestling ring? I never would say that because I've personally said never to things before and done them. But I am so happy where I am right now and I feel like I had such a pitch perfect career that I would be nervous about tarnishing that. I feel like it's kind of full-circle and perfect for exactly what I wanted. But who knows? One of the things that really stood out to me was one particular fight between your parents. You wrote that you heard a gurgling sound and then your mother scream that she was being choked. And here you are as this little girl and you bust through the door and thrown your tiny body on top of her as your father holds a TV over his head. He was ready to send it crashing down on your mother. The amount of bravery that must have taken is incredible. Were you even thinking at that point or were you just reacting? I think so much of my childhood is just reacting to whatever situation you're in; it was like this is what you need to do in the moment. You need to step up in every moment and just take care of yourself and everyone around you. My role in my family in my young age, probably way too young, was to kind of parent everybody even though I was the youngest in my family. I want to go back and hug that little girl. It's hard for me to re-read those chapters… I know that I'm not alone. I'm sure that a lot of kids have been in that type of situation. Getting that stuff out there was a way of letting go and healing and hopefully there's somebody else that realizes you shouldn't have to be that strong at that age. That was a tough one to write. I was thinking about the documentary UFC did on your husband, CM Punk. He was training for his first fight and you were so reluctant to go and watch him. Was some of that reluctance because of your experiences growing up and you didn't want to be surrounded by violence anymore or was it more that you just didn't want to see your husband get his face punched in or something like that? (laughs) I think it's a little bit of both and that's super perceptive of you. I've gravitated toward action that is more of the superhero romanticized variety. Superheroes and comic books and pro wrestling where the fear is taken out of it because there's a levity involved. With UFC it's so real and so violent that it's hard for me to even watch. The pay-per-views will be on in my house and I'll pay for it and I'll support it, but I can't really sit down and watch it. It's hard for me, especially with my husband. For someone who beat up people for a living I'm pretty queasy when it comes to violence for sure.